Strategia Worldwide have collaborated with Spire, a strategic advisory firm, to release a whitepaper investigating the threat of technological disruption to financial institutions (FIs). 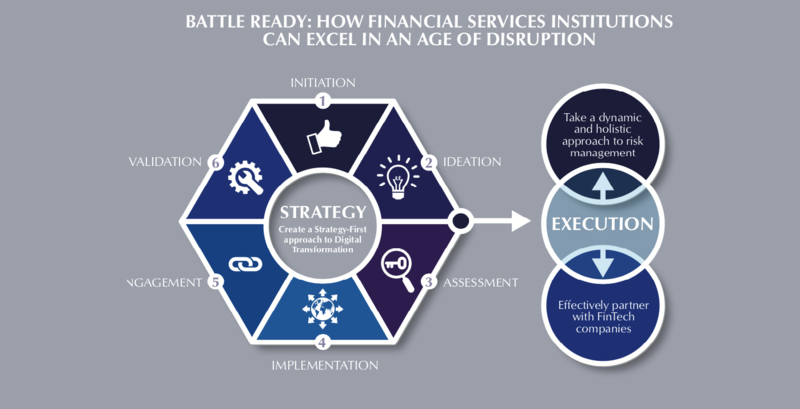 Formerly established players across the spectrum of financial institutions face unprecedented threats to the sustainability of their business and revenue models as customers increasingly adopt and embrace digital financial services. ‘FinTech’ sits at the heart of this dynamic. However, rather than viewing them as a direct disruptive threat, the real challenge to FIs arises from industry ‘verticalization’: the proliferation of FinTechs increasingly provides a platform for BigTech firms to accelerate their long-promised advance into financial services. Successfully combatting these challenges will require FIs to think and act differently in terms of strategy and execution. In this whitepaper, Strategia and Spire present an innovative ‘Integrated Transformation Framework’ to support Financial Institutions to help them in this challenge and in their quest for growth in this era of technology-led disruption. Scott Munro is Associate Director at Strategia Worldwide, with nearly 30 years’ experience in financial services, spanning senior leadership roles across all three lines of defence in both large scale and challenger banks. His prior roles include Risk Transformation Director, Chief Operating Officer, Strategy Execution Director, Director of Group Strategy and M&A, Head of Operational Risk and Head of Enterprise Risk. He has a particular focus on enabling a transformational change in organizational performance through effective risk management. Scott is currently studying for a PhD at the University of Strathclyde, researching the application of Stoic philosophy in the modern leadership context. He holds a BSc and MBA, also from the University of Strathclyde, and has completed the Advanced Management & Leadership Programme at Saïd Business School, University of Oxford. Matthew Hoffer Craig is Managing Partner at Spire Strategy, based in Zurich. Matthew specialises in simplifying complexity. He advises and collaborates with leaders from the public and private sectors to develop and execute uniquely impactful strategies in a world marked by unprecedented global systemic complexity. Matthew has lived, worked and travelled in every continent and speaks six languages. His global awareness enriches his capacity to bridge cultural divides and to strategise long-term growth opportunities for organisations facing a multitude of challenges in diverse environments across the world.